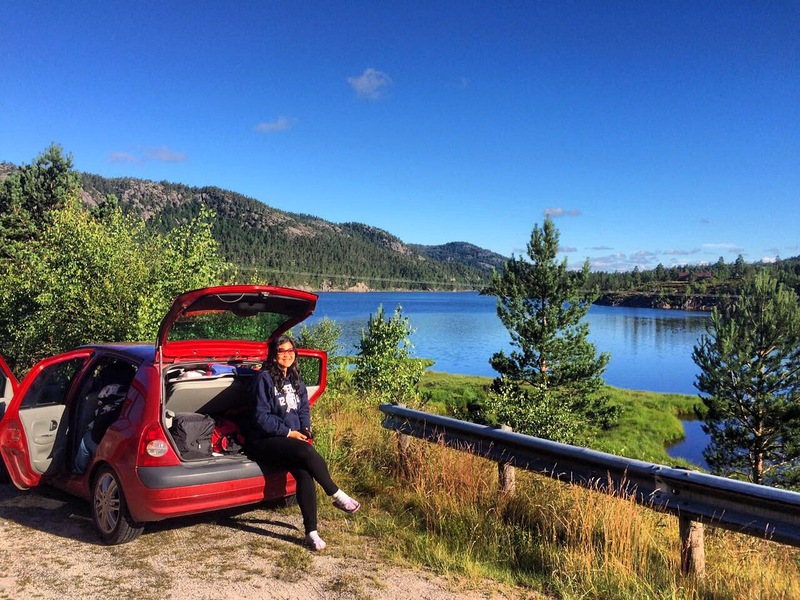 In between, my summer job at the university and master thesis writing, I decided to join my friends to have a road trip to Norway. Unable to contribute a lot in the preparation, I trusted them to choose the cheapest options for the trip. The initial plan is to take our rented car Sunday noon. We rented the car for 1900 NOK from nabobil.no (I kinda forget how many km we got for that and how much we needed to pay for extra km), packed our bags and started the road trip Sunday, July 3rd at 3pm. We calculated that it would take us 4h 30min (google estimation) to get to our first camping ground. Being realistic, we hoped to be there at 9pm. The destination was Odden Camping in Evje, because it would then took us around 3h in the next day to drive to Lysebotn and hiked to Kjerag. But plans were just plans. Firstly, we decided to cook lots of food, as some of us brought packages of seasonings from Indonesia. So we prepared, Ayam Rendang, Telor Balado, lots of cooked Jasmine Rice, Fried Egg Noodles, etc. Preparing these food took us so long that we left Stabekk at 8pm! Secondly, it’s a first time driving on the left side for my friend, opposite from how he drove in Indonesia. So, he had to feel the steering wheel and the road condition. It was on the go when the darkness fell in which he had to adjust again with the surroundings. The car did not have working GPS, but I downloaded the map on my iphone 6. Thirdly, since it was summer days in Norway. There were so many road constructions. And we got redirected for 2-3 times (could not remember precisely due too much stress on it). The thing was, it was a pre-downloaded map, which I thought would have lost a lot of features during offline. Fortunately, not! But we did experience some mini heart attacks when in the middle of the night, we needed to detour to only-god-knows-where. We were extremely tired and cold at 1am, decided to give up on reaching Odden Camping, instead, we just parked in the middle of nowhere, put up our tent and slept. We woke up the next day literally almost dying. We did not realise that there was a huge cliff blocking the morning sunlight to our tent. So, instead of waking up in the warmth of the Sun, we were soaked wet with cold Norwegian morning dew. omg. Thankfully, we had our food stock ready. So, we decided to have breakfast. Well, surrounded with so beautiful nature and delicious Indonesian food, we could feel the day will be brighter. And it was. We also stopped for a cup of coffee in a small cafe on the road side that really looked like the shop in Frozen movie. The cafe owner was so nice and friendly, surprisingly, since I thought Norwegian would be as cold as Danes. We had a good afternoon there. Since we could not go up to Kjerag today, it will take 6hours return hiking trip there, we decided to explore Suleskard instead. It’s in one of the must-see-places in Norway, so off we went there. It was nothing like I had seen before. Just magical. But one thing to note: Be careful with the goats. We filled up our gas for 500, 07 NOK before going to the camping ground because I did not want to have trouble in the next morning. We arrived in Kjerag Cafe & Restaurant (Ørneredet) for a cup of hot chocolate in the afternoon. We just took some information for tomorrow’s hike. It was our first hike in a Norwegian mountain, so we just need to make sure everything was ok.
We drove down to Kjerag Lysebotn Camping Resort. It was 330 NOK for 1 tent (inc. kitchen, charging, and parking). Toilets were free but you will need to pay extra 20 NOK for 6 minutes of hot water shower. It was an amazing Lords-of-the-rings-settings-look-alike camping ground. We got up early, had our filling breakfast, got our energy bars ready for the hike the next morning. We paid the parking ticket at Kjerag for 150 NOK and off we went to see the magnificent Kjeragbotn. I had to give credit to my buddy, Rheden for staying with my slow pace hike. He supported me all the way to the top. It was a 6h return hike of up and down hike to three rock mountains. So, yes, it was intense. In some parts, you need to walk on or cross some glaciers. I fell twice, had some open wounds and bruises after the hike. But,no regret whatsoever. In fact, if you were reading this to assess whether you could do the hike. I would say, yes, you could do it! It was a heavenly satisfying. But rumour has it, that there is one more hiking trail that is so much better than this, Trolltunga. At first we were hesitated. Since we were very tired and it would sound almost impossible to do another, even more, difficult hike the next day. But weather took hold on everything. We were so lucky to have a good weather in Kjeragbotn, so people could not step on the rock because it was too slippery! We drove down to the camping ground to take the cruise ferry, one, to cut some travelling time, and two, to see the fjord from different perspective. It was bloody expensive. We had to pay 990 NOK for 1 car + 1 driver with 3 passengers for an hour cruise ferry. Take all the money if you will, but it worth every norwegian kroners that I spent! Again, we had to detour from our first plan. But this time we were a little bit wiser. We took another smaller ferry for 133 NOK . We were heading to Odden Camping ground for the night, but it seemed to be slightly difficult. So, we opened our eyes to the nearest hiking ground, which by the way, there were many, while at the same time enjoyed the view Trolltunga bound. And god be gracious, we passed Hardanger, one of Norwegian National Tourist Route. 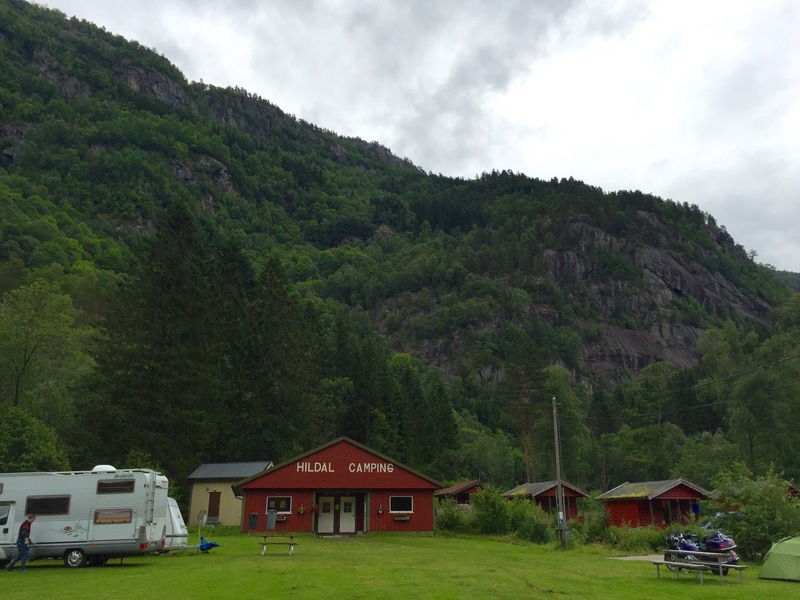 We decided to stay the night at Hildal Camping ground. We did not pay for our stay because we arrived around midnight and left early before 8am. So, the office was not opened at anytime we were there. We hope for the best for this camping ground. next days here and here.